The Rebel Sweetheart. : Foodie Goodie | Kalbi Taco. It's Korean meets Mexican in this week's edition of Foodie Goodie! 1. Prepare the Kalbi mixture by combining the first six ingredients in a bowl. Let stand for at least an hour. 2. Heat a frying pan on medium-high, add Kalbi mixture and cook until brown. 3. Add mushrooms to the pan, stir-fry for about two minutes. 4. Add onions to the pan, stir-fry until the onions soften. 5. Add the tomatoes next, stir-fry for about a minute. 6. Spoon the Kalbi mixture into the taco shells. 7. Top with lettuce, cheese, and mayonnaise. Serve. Sounds interesting-but you lost me at the soy sauce, that and MSG make me swell up like a balloon. Now if I was a lot younger I would have tried this in a NY second! TACOS!!! I want! This a fun twist for kalbi :) Yummm! Will try this one of these days and I'll let you know whether I succeeded or not haha! tacos! would love to try something similar .. thanks for the idea, sis! 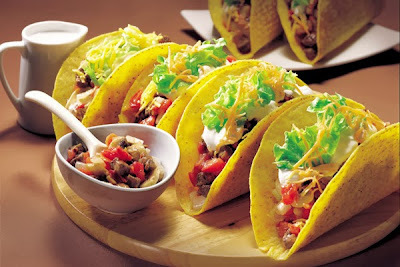 Tha Kalbi Taco can be the perfect snack and also a good appetiser and meal for the diet conscious. I haven't had Kalbi before, but I'd like to try that! Your Kalbi tacos make me drool! I want!